Caswell County is a small, rural county located on the Virginia border. It was established in 1777. The county seat and largest town is Yanceyville. The county’s namesake is Richard Caswell, the first governor of North Carolina after the signing of the Declaration of Independence. The county is a major agriculture producer, but tobacco is especially important. It was in this county that flue-cured tobacco was discovered, and the innovation brought wealth to Caswell. The loss in popularity of tobacco has hurt farmers in this area, and efforts to diversify the economy have not met with much success. This lack of economic opportunity has produced an exodus of young people, mainly to the cities. 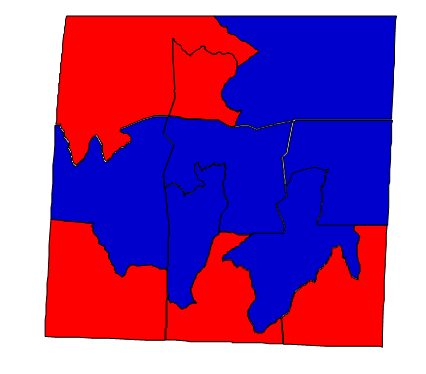 Politically, Caswell used to be one of the strongest Democratic counties in the state and gave heavy support to rural Democrats. But as Democrats became more liberal, both in the state and nationally, voters here have gradually abandoned their support for that party. The major decline has come with white voters, who now vote overwhelmingly Republican at the federal and increasingly the state level. In 2012, Caswell was one of four counties in North Carolina to swing from Barack Obama to Mitt Romney. Forecast: The rural Democrats of Caswell County were so loyal to their ancestral party that they backed Walter Mondale in 1984. Four years later Caswell went for Dukakis, then Clinton. Clinton won here again in 1996, but his support was much reduced because of his administration’s attacks on tobacco, the key cash crop for most of the county’s farmers. The realignment was complete in 2000, when voters here backed George W. Bush. A surge in black turnout brought the county back to the Democratic column in 2008, but Romney won here in 2012. Romney took back Caswell by winning a commanding 80% of the white vote. Though this is probably the ceiling of Republican white support, the GOP’s advantage in Caswell might grow through demographic change. Notably, Caswell County is more white than it was in 2000. The black population fell from 37% to 34%. This pattern of blacks leaving rural counties is evident throughout the state, and national Democrats have stayed competitive here only because of greater registration and turnout from African Americans in recent years. If this trend continues, Caswell County will get more Republican, though it must be stated that there is lingering affection for legislative Democrats here. Recent population estimates point to Caswell losing about 9% of its population by 2020. Whether or not this reduction is from whites or blacks will in large part determine the county’s political future, at least in federal elections. A strong Democratic candidate like Hillary Clinton would be very competitive here and would be favored to win should she maintain her current levels of popularity. One thing is certain, however, the days of Caswell being a Democratic stronghold, at least in federal elections, are over. The state could prove to be a bellwether in the future. It certainly was in 2012. Mitt Romney won North Carolina by 2.04%; he carried Caswell County by 2.22%. And Caswell, like the state of North Carolina as a whole, switched from Obama to Romney that year. Keep an eye on this true “swing” county.